As the world's favorite pop princess, Hannah Montana (aka sweet Southern gal Miley Stewart) has amazing one in a million experiences that happen in the blink of an eye - and they all come with drama. 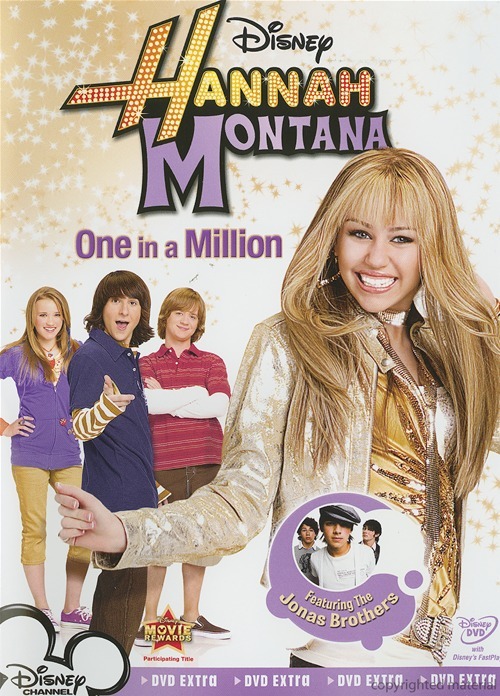 Four hilarious episodes from the smash hit Disney Channel Original Series are packed into Hannah Montana: One In A Million - including a special episode starring the Jonas Brothers! Plus, go behind the scenes for exclusive bonus features, like reliving famous feuding moments with your favorite Disney Channel characters. Meeting the totally rockin Jonas Brothers is awesome - till Hannah learns they'd rather be hanging out with Robbie Ray. Miley's dad goes on a date with Lilly's mom - but will sisterhood ruin the BFF's friendship? Jake comes back to town - and gets friendly with Mikayla, Hannah’s archrival. And the Stewart family gets feisty over an old feud (hint: Elvis was in the house). Sweet nibblets! Can't they all just get along? Join Hannah and her wonderfully funny family and friends for laughs, (mis)adventures and totally rockin music.